"I wouldn't say you get used to it, you'd just register it." Mein Krieg has a unique slant on presenting memories of World War II. Six German soldiers are interviewed and film footage they shot during the invasion of and retreat from Russia in 1942 through 1944 is shown. Interestingly, no personal information about the interviewees is presented. Aside from technical details of actually making the films, these men do not provide any profound insights into the war or on being a German soldier. The footage is in surprisingly great shape and is often very interesting. The story begins with young men who enter the training camps of the Hitler youth and follows them as they become soldiers in Germany's Wehrmacht and are sent to invade Russia. The interviewed soldiers tell of their varying feelings of pride, fear and confusion at their orders. There are some poignant scenes as one soldier describes filming the ruins of Warsaw. As the army moves across the Steppes of Russia, the soldiers learn more about the politics of their country; they find that no one is being "resettled" in the East; that civilian peasants are executed and the untermenschen (subhumans) that they are told they are fighting turn out to be people just like themselves. Some of the harshest scenes are shown as the Nazi dream dies in the brutal winter and the once proud army is beaten back to their Fatherland. Not much new ground is broken here in understanding the war and the people who fought it; but the fact that an attempt is made to reveal the "human" side of war and its repercussions is a positive element. This is definitely a compelling viewing experience, knowing these films were shot by soldiers on the line rather than the professional newsreels or propaganda pieces one sees again and again on cable stations like A&E and The History Channel, which seem to specialize in endlessly recycling World War II footage. Documentaries about Germany and the Nazis always walk a fine line between honest analysis and glorification of the era. There are definite moments in the interviews when one realizes that some of these soldiers are not quite convinced that the war they fought was wrong. This is not really a disc that your average DVD consumer will necessarily want in their collection—it does not seem to be a show that has much repeatability. But, there is a place for documentaries like this and it is great that there is a medium like DVD to preserve the thoughts of these men and the films they made. Image Transfer Review: The transfer is very good with crisp presentation of what could be very difficult footage to digitize. The film shot by these soldiers is over 50-years-old and although in the realm of "home movies", some of the quality is remarkable. Audio Transfer Review: The audio on this disc is nothing special as it consists of interviews in German and silent film footage. There is no music used in the documentary. The only sound is often the clatter of a film projector running to enhance the feeling of watching home movies. Extras Review: It would seem only fair to want some raw footage as an extra on a disc like this. The documentary is only average and the actual footage shown is truncated. I felt that much of this needed to be placed in context for the American audience. Some interactive maps or other historical materials would have gone a long way toward making this a richer historical experience. 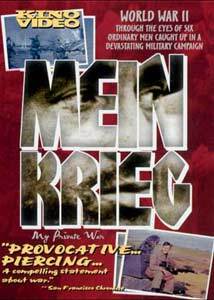 This disc is really recommended only for World War II buffs of the most extreme sort. There will be a place for this disc and others like it on library shelves or other research facilities. Not very special as a documentary, the DVD suffers from the lack of raw footage.